Sunday Post: Children’s Games – Monopoly Rocks! – My 500th Post – Plus a Giveaway! My blogging friend, Jake, over at Time After Time,did a post this past Sunday on Children’s Games – and I knew I had to participate! 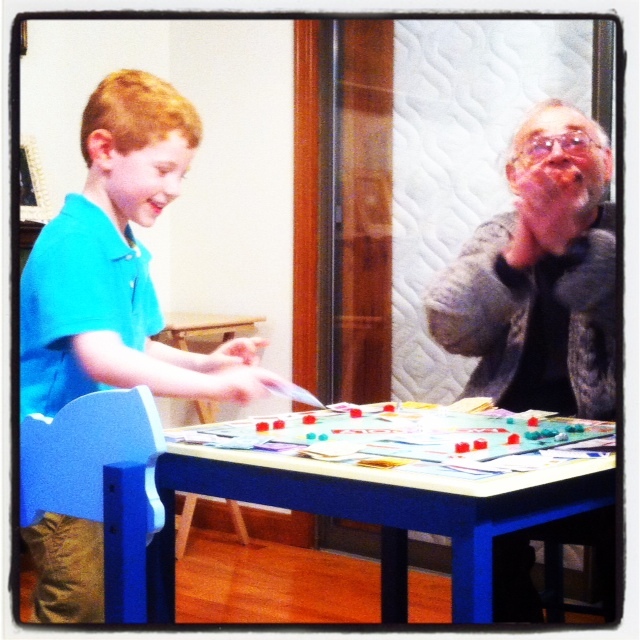 5-year old Jeremy playing Monopoly with his grandpa. Why should we play games with kids? It’s a great way to spend time with children – affirming the fact they they are valuable and worthy of your precious time! It provides an amazing opportunity for conversation – one of the finest language-builders for kids! 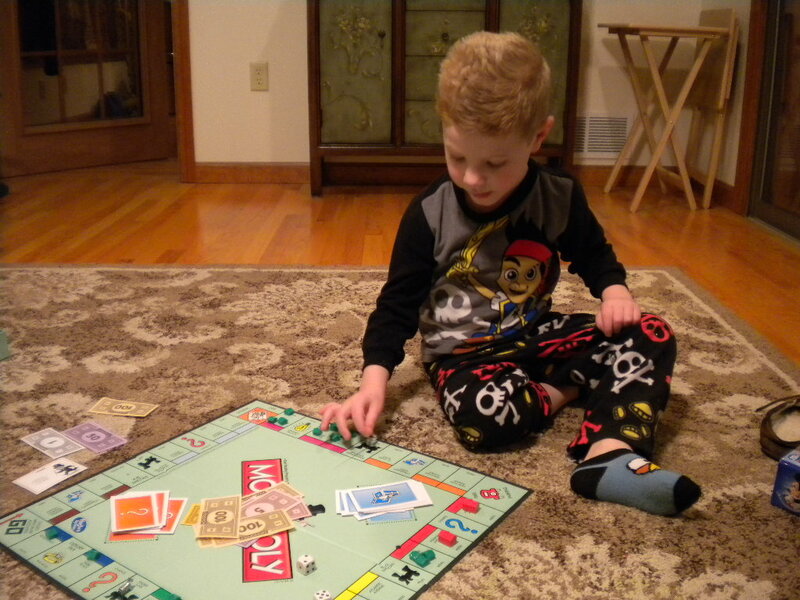 It develops math and literacy skills – In Monopoly, for example, Jeremy has to figure out how much change he should get when he purchases a property, he has to read the chance, community chest and property cards, he has to count the spaces as he moves his piece! It’s FUN for both parent and child! What games do you and your child play? Playing games is only one of the ways we can spend time with our kids. Kids also enjoy arts and crafts. They really enjoy helping out in the kitchen. And they LOVE being read to. In honor of this being the 500th post on my blog, I’m giving away a copy of my parent/teacher/child activity book, Show Me How! Build Your Child’s Self-Esteem Through Reading, Crafting and Cooking. In the package, I’ll also include a couple of craft supplies to get your child started on his next project. Please leave a comment here and on my Facebook page: http://www.facebook.com/showmehowbuildyourchildsselfesteem. We’ll announce the winner in our Mother’s Day post! Visit http://jakesprinters.wordpress.com for weekly Sunday posts. This entry was posted in Children's Games, Monopoly, Sunday Post and tagged 500th post, Activities for Kids, Giveaway, Monopoly, Sunday Post: Children's Games by viviankirkfield. Bookmark the permalink. Congrats on 500 posts! What a great achievement! We still get to play games with our girls. They love the time we spend together while we do so. One of our favorite “after dinner” family games (sans TV) is “Apples to Apples.” The grandchildren, 10 and 9, alternate being the “judge” with the adults, and we have a great time. 500 posts! Whew! You’ve been a busy lady! You can pass GO and collect your $200! We’re all about games here at our house. They pull families together in fun ways. Gotta love Monopoly…I wonder, they have so many versions…do they have a doggie themed one?